See below for details about the latest commission. 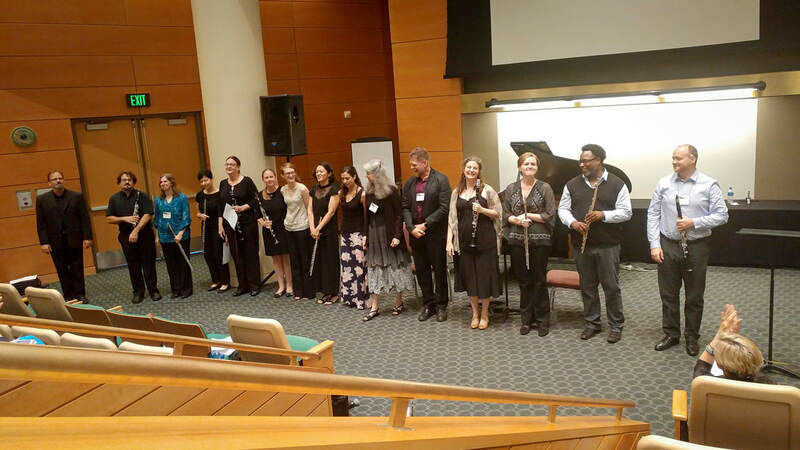 The FCDC was formed in 2001 to create quality repertoire for flute, clarinet, and piano. Groups and individuals from around the country (see list below) have participated to commission works which are already staples of the repertoire. Barn Dances: Libby Larsen (b. 1950). Oxford University Press (2004). Twin Trio: Derek Bermel (b. 1967). Peer Music (2006). Suite: Portraits of Langston: Valerie Coleman (b. 1970). VColeman Music (2007). Triple Set: Pierre Jalbert (b. 1967). Schott (2016). We are thrilled to announce that the FCDC’s newest commissioning project will be a new work for fl/cl/pn (expected in Summer 2018.) by award-winning Chicago area composer Roger Zare. Zare, assistant professor of composition at Illinios State University, has had his works performed on five continents by clarinetists Burt Hara and Alexander Fiterstein, the Donald Sinta Quartet, the Minnesota Orchestra, the New York Youth Symphony, the Sarasota Symphony, and the American Composers Orchestra among others. Go to rogerzare.com for much more information about the composer. WHEN - The work is scheduled to be completed and distributed to Consortium ensembles by July 1, 2018. COST - $125 per ensemble due by March 1, additional $125 per ensemble due upon receipt of piece. *Note: We have changed the procedure from the last commissions. Those joining the consortium for this commission will deal directly with the composer for the contract and payment. Michael Webster (president), Leone Buyse (vice-president/secretary), Michael Isadore (treasurer), Jill Felber, Paul Bambach. Current FCDC Board Members: Joanna White (president), Kennen White (vice-president/secretary), Michael Isadore (treasurer), Leone Buyse, Jennifer Isadore, Nicholas Morrison, Leslie Timmons, Michael Webster. August 11, 2017 - NFA Minneapolis Convention session (organized by Joanna Cowan White and Kennen White) A brief history/overview of the FCDC, a discussion of how consortiums work in general, performances by consortium members of selected movements from the previous commissions, and a complete performance of the newest work, Triple Set by Pierre Jalbert. Performers included Michael and Jennifer Isadore with Maria Boucher, the Holden/Olin Duo: Marissa Olin and Jonathan Holden with Maria Boucher, the Parhelion Trio: Sarah Carrier, Ashleé Miller, and Andrea Christie, Protea: Dennis Carter, Lisa Raschiatore, and Maria Boucher, and Reflections Chamber Ensemble: Francesca Arnone, Stacy McColley, and David Gilliland. Helen Ann and Richard Shanley.